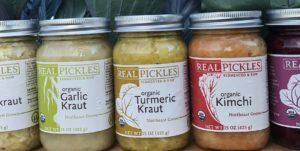 Real Pickles® is a small, worker-owned co-operative producing pickled products that are raw, vinegar-free, 100% organic, and rich in probiotics. Their products are made using the traditional natural fermentation process that has been used for centuries all over the world. In support of a regional food system, they buy all of their vegetables from family farms in the Northeast and sell their products only within the Northeast. 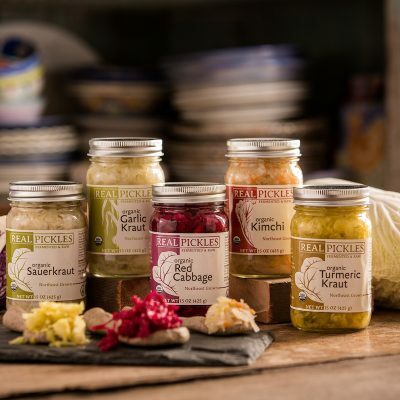 Visit Barstow’s Dairy Store and Bakery to find Real Pickles products like garlic dill pickles, sauerkraut, and a variety of pickled veggies! We are big fans of adding pickled beets and pickled carrots to our burgers! Tasty and colorful too! Check out their website at www.realpickles.com.